The 2018 Tennessee Advanced Energy Economic Impact Report further defines the scope of Tennessee’s robust advanced energy sector. Updated with new stats from the original 2015 report (the first document of its kind defining the scope and scale of Tennessee’s advanced energy sector), the 2018 report quantifies Tennessee’s advanced energy economic impact even more. It identifies the number of jobs, contribution to state GDP and state/local taxes and number of companies associated with the state’s advanced energy sector. Rather than favoring specific technologies, the term advanced energyis technology neutral. Any technology that makes energy cleaner, safer, more secure and more efficient is considered advanced energy. Examples include electric and plug-in hybrid cars, lightweight composites for the automotive industry, natural gas fueled trucks, pollution control equipment, bio energy, high-performance buildings, more efficient industrial processes, power reliability, smart grids, combined heat and power and the latest wind, solar, and nuclear technologies. Examples of Tennessee’s advanced energy industry are scattered throughout the Tennessee Advanced Energy Economic Impact Report to give the reader a better understanding of the breadth and depth of the advanced energy economy. The advanced energy industry represents a sound candidate for inclusion as a statewide targeted industry cluster. Tennessee and its local communities commonly target specific industries and industry clusters as part of their broad-based economic development strategies. These targets then become the focus of business recruitment, expansion and retention strategies through a variety of policies including marketing, workforce development, infrastructure development and incentives. The targeted approach to economic development is intended to maximize the returns to business development efforts and better coordinate public policy. Compiling this information is important for our state and for our members, and here’s why: The global energy sector is rapidly changing. These changes are rippling through all sectors of the economy in increasingly visible ways, leading to the emergence of what is now called the advanced energy economy, a $1.4 trillion global market. Neighboring states like Arkansas, North Carolina and South Carolina, however, have been benchmarking and touting the strength of their advanced energy economies. Their stories tell us that other states have recognized the economic importance of this emerging sector and are vying for a piece of the $1.4 trillion global market. Yet, as you will see, Tennessee is well-positioned to gain a significant portion of this trillion dollar pie. Research for the 2018 Tennessee Advanced Energy Economic Impact Report was conducted by The Howard H. Baker Jr. Center for Public Policy and funded by the University of Tennessee and The Energy Foundation. 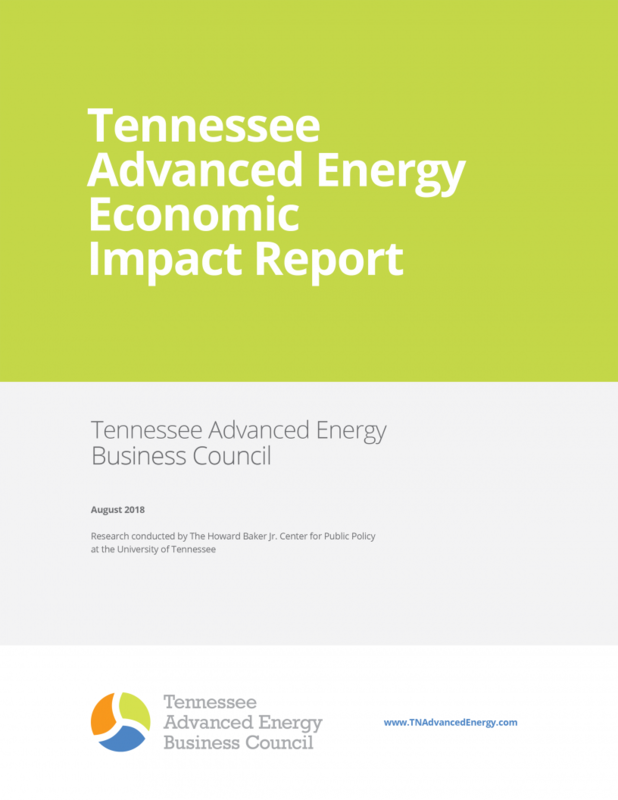 The hope is that the Tennessee Advanced Energy Economic Impact Report provides a context for decisions by public officials and private sector leaders to make lasting contributions to Tennessee’s economic base for the next decade and beyond.